I was asked to clarify if minimum annual fees are still charged monthly, and how many providers offer a flat fee structure (as opposed to charging a percentage of turnover). The answer is that most providers have moved away from quoting a minimum annual fee, towards quoting minimum monthly fees. The effect is the same, but I guess the number presented to a prospective client seems much smaller i.e. one month's minimum instead of a years. Regarding flat fee structures, approximately 20% of providers offer that kind of arrangement, whereby the client pays a set monthly fee, instead of a percentage of turnover, although these flat or fixed fees can sometimes be charged at a premium to the normal method of pricing. This prompted me to look at some of the minimums we have been quoted recently in respect of an confidential invoice discounting client. 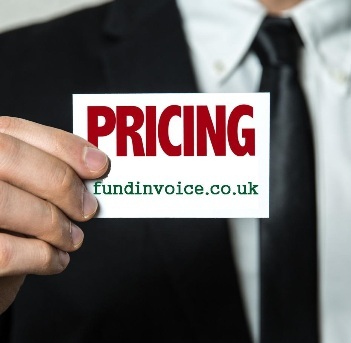 It is common practice for invoice discounting companies to include a minimum monthly fee in their offer, although some will offer without quoting minimums. The purpose of this practice it to ensure that the client reaches at least a fair proportion of the turnover that they say they are projecting. The reason for this is that the fees for invoice discounting are often quoted as a percentage of the turnover that goes through the facility (the value of the invoices discounted). So if you discounted say £10,000 of invoicing, with an administration charge (often wrongly referred to to as service charge - which is the correct term for factoring facilities) of say 0.6%, you would pay £60 in administration fee (plus a discount charge which doesn't normally affect the minimums). This might be typical of an average quote for a business projected a turnover of around the £1m pa mark. So over the year the discounter might expect to charge £6,000 of administration charges. However, if that business falls way below the projected turnover the income to the discounter would be far lower, and hence a smaller deal might attract a higher admin fee percentage. This is the purpose of the minimum, to ensure that the volumes discounted fall somewhere near the volume on which the discounter based their costing. When we sourced quotes for an invoice discounting client recently, we were able to compare the discounters approaches to setting their minimum charges. The results were quite interesting - and demonstrate that you need to compare approaches and choose wisely, to avoid high charges. A small number of discounters actually quoted a minimum monthly fee that would EXCEED the fee expected to be earned (administration fee percentage x projected annual turnover). This means that if the client achieved their projected annual turnover, they would still be subjected to monthly minimum charges. The range of these minimums was between 105% and 111% of the projected administration charge. Prospects need to be very careful when comparing quotes to ensure that a minimum is not going to bite, increasing an artificially low service charge percentage to a higher figure. So often we see clients that only compare the headline service charge percentage between quotes. On average the minimum was set at 86% of the fee expected, according to the client's projections. Removing the small number where the minimum exceeded the projected fee, the average was reduced to 80% of the projection. This means that the client would have to exceed 80% of their projected monthly turnover, every month, in order to avoid incurring a minimum charge. The projected monthly turnover would be £83,333.33 each month. A minimum set at 60% would bite if turnover was below £50,000 each month. A minimum set at 94% would bite if monthly turnover fell below £78,333.33. That is a huge difference of over £28K per month of tolerance in the level of monthly turnover required to avoid incurring minimum fees. It should also be considered that you might have the odd month when turnover falls short of your projections, so ensuring that you have the greatest tolerance possible in any minimums is likely to be shrewd practice. Similarly, if you are a seasonal business, you may find that your turnover peaks and troughs throughout the year. Once again, the greatest flexibility in any minimums could be very helpful, as could restructuring the minimums to account for seasonality throughout the year.